I like a good thunderstorm... when I'm safe inside somewhere. Today we had a 40% chance of thunderstorms moving in after noon, with 20 mph winds gusting to 30, and a 70% chance of rain overnight. I think I was the only one of 56 riders on the Wild Horse Butte ride who even noticed the cloud patterns and the development throughout the day. Steph knows how afraid I am of lightning, and she said, "Don't worry, you won't be up high." 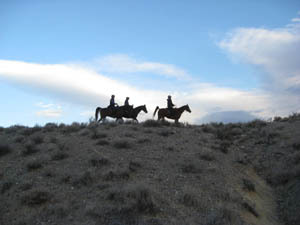 Well - not up high in the mountains, but up high on the wide-open flat, exposed plateau where every horse and rider is taller than all the sagebrush! But I tried not to think too hard about it during the day as the clouds developed. 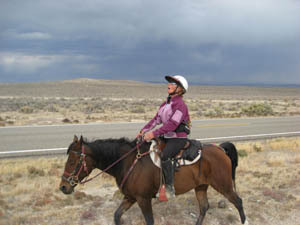 And Connie received a great blow early on in her endurance career: she lost her scheduled mount. This was on Rhett, the horse that everybody loves most. 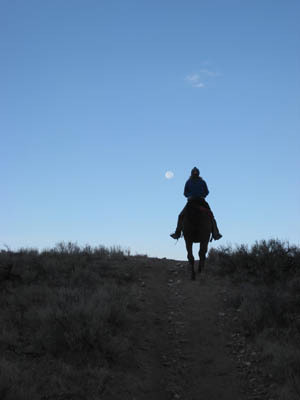 She'd been looking forward to it all week, but that's what happens sometimes - the mount you thought you were going to ride isn't available, or, you travel all the way from British Columbia to Idaho to do a 5-day ride, and your horse goes lame. When Connie heard that had happened to Barbara Holmes, and that it was also Barbara's 64th birthday today, well, it was pretty easy to give up a mount for that. Besides, Connie got to ride Jose instead, and everybody loves to ride Jose almost as much as Rhett. Connie and I teamed up with Gretchen Montgomery for the 50; I rode Gretchen's extra horse Raffiq, another horse buddy of mine who I've ridden some 700 miles over the years. Gretchen rode her mare Spice. We rode along at the back of the pack again, because Jose - although he knows a lot of new tricks now - isn't quite fit enough to go too fast. On another beautiful and chilly morning, we headed out up onto the flats and north toward the Snake River. We girls had a great time, whooping and Yee Hawing along our trail, and the horses appeared to be having their own good time. Raffiq - who got his 4000 miles yesterday with Gretchen - cruised along at his steady Raffiq Shuffle. I swear he knows how to follow ribbons now, and not just heading for home. The only bad thing that could be complained about were the bugs that swarmed us when we slowed to a walk. They were tolerable to us humans, but they were really torturing the horses - ear bugs that kept them all shaking their heads. We were wishing for at least a Bug Breeze - say, an 8 mph wind - that would blow the bugs away, but instead, we kept up a steady slow trot to keep them at bay. We were riding in the Snake River Birds of Prey National Conservation Area, where 24 species of raptors migrate through or nest. We only saw a red-tailed hawk all day, but thirty yards away, loping beside us for a bit was a coyote. Three years ago not far from here I saw a black wolf, and two years ago I came across wolf tracks. Also two years ago, same area, two riders (including Tom Noll on Frank) were following cougar tracks on a morning loop. 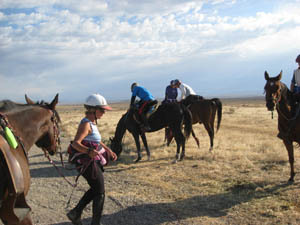 After 19 miles we came into the first vet check, where the horses dove into their grain and hay for the 40 minute hold. I noticed the first inkling of clouds over the Owyhee Front Range, but I didn't say anything - yet. From there we had a 20-mile loop out and around Wild Horse Butte, a gentler decline that led us right down to and alongside the wide Snake River. The bugs were still bad down by the River, but we'd smeared bug juice in our horses' ears, so they were happily not tortured by them any more. It was quite warm there too - we'd overdressed a bit just in case the rain and wind started before we got back to the second vet check. 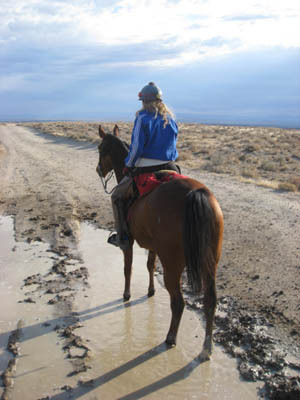 Instead, when we stopped for water where the trail turned back up onto the flats, Gretchen fetched the water bucket that had been left there for us (it was a bit too swampy for the horses to safely get to the River's edge), and doused all the horses (Jose's first time! ), and herself, thoroughly. Connie and I about had to tether her to her horse so she didn't go swimming in the Snake. On our way back to the vet check at the same spot, we spent some time travelling along the Oregon Trail. I always think about the pioneers who made these trails, and how this area must have looked 100 years ago with only a handful of people living here (not that there are so many now!). The entire sky had clouded over by the time we got back to the vet check, and the wind had kicked up a bit, blowing clouds of sand through the camp. So far, and I know by being out in far too many lightning storms, we were just looking at rain. Except for this one spot of dark blue clouds that looked a bit like a cow's udder. And we were headed that way. Out for our last 11 miles home, back south, across the highway, with heavy, dark blue rainstorm clouds dumping along the Snake River where we'd been, and heavy blue and purple and gray questionable rain clouds ahead of us... and we were up on the flats now for our final stretch home. 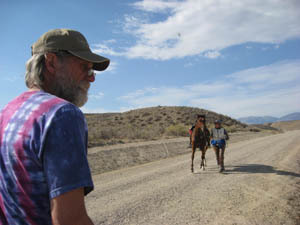 We had a good drink at a water stop about 5 miles from home, then I put Raffiq in front, and kept up a good steady trot, whether Spice and Jose wanted to follow us or not. The wind picked up strongly, and we could see a rain storm blowing through Pickett Creek and base camp far ahead and below us to our left, and, straight ahead of us, darker clouds. The rain drops finally hit us, and I stopped to put my jacket on, then urged Raffiq onwards. I wanted to get OFF this exposed mesa, just in case. I wasn't scared... yet... Connie and Gretchen swore they hadn't heard any thunder yet, but with the wind now blasting us 20 mph in the face, we wouldn't have heard it if a bolt had hit beside us. The rain shower in Pickett Creek dissipated quickly, and just as quickly, the rain drops pelting us blew onward, and we were actually now headed into a bit of sunshine. 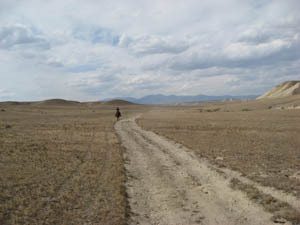 We dropped off the high plain into Bates Creek Canyon, and made our way through the washes and down the road into camp. There had been only 2 riders behind us all day, and on our last loop in, we passed 2 more people. Connie was pretty excited that she wouldn't get the Turtle Award today, but we told her that if for some reason those 4 riders got pulled at the finish, she could once again be the Turtle. Just in case, Gretchen and I made sure she crossed the finish line in front of us. After all the horses had come in, and as we were all sitting down to another delicious dinner catered by Deborah and Al Linder of Blue Moon Catering, the cold front blew in with those 30 mph gusts of wind. All riders, bundled up in layers of thick jackets and hats, gathered around the 'stage' very closely for the ride awards - Steph doesn't have a megaphone - and to listen to head veterinarian Dr Michael Peterson as he gave another little talk. Again he held everybody mesmerized with his knowledgeable and passionate talk on the importance of feeding roughage (a little bit often is better than a lot once or twice a day), fat instead of carbohydrates (won't make a horse 'hot,' and won't heat the horse up and therefore possibly contribute to metabolic problems), and the importance of Omega-3 Fatty Acids, and the link between them and help for arthritis. You could have heard a pin drop (if the wind hadn't been blowing a gale) for everybody listening to and hanging on every word he spoke. 39 of the 40 starters finished the 50, and 15 of the 16 starters finished the 30 mile ride. 10 horse and rider teams on the 50's are still going strong for all 4 days. 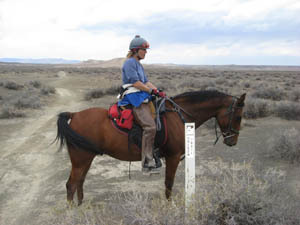 With one more day to go, Nance Worman is still in contention for the Owyhee Tough Sucker Award - all eight days of 50-mile Owyhee Endurance Rides - and Tom Noll is up for the Owyhee Really Tough Sucker Award, which is all 8 of those rides plus a 100-mile ride. 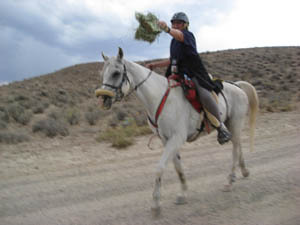 Tom's rides were all on Frank, so that would make Frank, what - Idaho Super Tough Sucker Horse of the Year?